The 2017 ITTE Conference was hosted at the University of Hull. 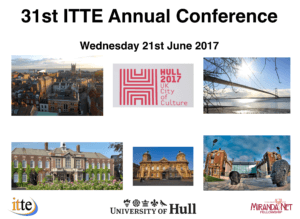 Held in Hull, the UK City of Culture 2017, the ITTE conference was co-badged with MirandaNet and run in association with the final MTTEP conference and the Digital Technologies Network. It was an unmissable event, with over 100 delegates some of which are coming from as far afield as Australia and the USA. Our two keynote speakers include Lord Jim Knight (TES Chief Education Advisor & ITTE Patron) and Bob Harrison (Member of ETAG, FELTAG, Chair of Governors Northern College and Board Member UfI Trust). For updates please keep an eye on the website or follow us on Twitter @itteorg. If you have any queries about the conference, please contact ‘conference@itte.org.uk’.